‘Thanks!’ From Mt. Abraham Union High School for Successful Safety Fair! On a grey Friday, Mt Abraham Union High School hosted an inaugural Safety Fair in collaboration with the Youth Safety Council of Vermont and many area volunteers and organizations. The day began with a “Mock Crash” organized by students in the Mt Abe Vermont Teen Leadership Safety Program (VTLSP). As part of their year long effort to increase health and safety awareness among their peers, these students planned the event which brought student actors, members of the Bristol Fire, Rescue and Police Departments and the Middlebury Rescue Department together to stage a simulated crash scene caused by distracted driving. As the high school students and teachers looked on, emergency responders arrived on the scene, securing the vehicles and addressing the staged medical needs of the students. A narrator explained the process and the likely outcome for the driver who caused the crash with his distracted driving. 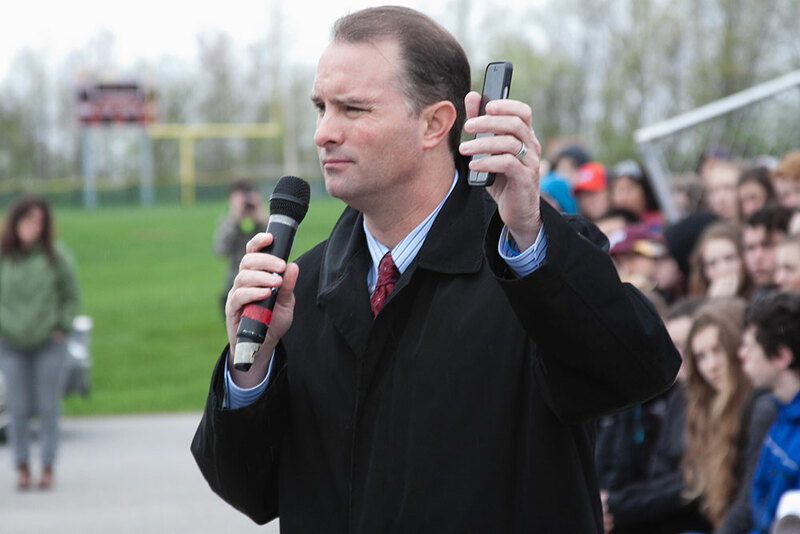 Attorney General TJ Donovan was on hand and shared a strong message urging students to take their own and others’ safety to heart. Automobile crashes are the leading cause of death for teens. Through this dramatization, VTLSP and the emergency responders hoped to highlight the real and tragic results of distracted and impaired driving to encourage students to use safer driving practices. After the Mock Crash, high school students moved on to a full day of safety related workshops as part of the May 5th Safety Fair. Volunteer presenters offered over 25 different workshops covering topics from Tire Safety and Emergency Kits to Drugs 101 which taught students the effects of various drugs on driving skills, and from Healthy Relationships to Ending Distracted Driving. The Safety Fair was the result of a months-long collaboration of MAUHS students and teachers, the Youth Safety Council of Vermont, community members, businesses, and safety experts from around Vermont. The goal was to offer students a day filled with opportunities to think about and learn about personal safety on the road and in many other aspects of their lives. With the help of a generous donation by Co-Operative Insurance, the school was able to offer scholarships for students to complete CPR certification, provide lunch for the guest presenters, and identify student volunteers with bright Safety Day t-shirts. While the day began with a somber reminder of the risks of distracted driving, students ended the day with a festive reminder of how much their community cares about them. Thanks to donations from local businesses and individuals as well as AT&T, the final send-off of the day was an assembly where Principal Jess Barewitz reminded students to keep themselves and each other safe because, “You are loved,” followed by raffle-style giveaways to those who participated in the day. Many thanks to everyone who made this Safety Fair possible, including Attorney General TJ Donovan, Co-Operative Insurance, Buy Again Alley, Green Mountain Shoe and Apparel, Bristol Fire, Rescue and Police, Middlebury Rescue, AT&T, Heritage Ford and Toyota, the Youth Safety Council, Mt Abe school store and yearbook, Bill Mitchell, Annemarie Altadonna, Associated General Contractors of VT, Vermont State Police, UVM Medical Center, VT Department of Health, Sharon Huntley, TextLess Live More, Langrock Sperry &Wool, Vermont Fish and Wildlife, Amanda Bolduc, WomenSafe, Elliot Cluba, Vermont Family Forest, Fire ProTec, Sharon Compagna, AAA of NNE, Trooper Flansburg, VT Fish and Wildlife, Jim Carter and Tammy Shackett, Pierre Cotton, Local Motion, Middlebury College, UVM Extension, VT National Guard, ANESU Food Service, TurningPoint Center, Hallstrom Racing, Parent Child Center, student actors and make up artists, and the teachers, staff and students at Mt Abe! (Report provided by Sharon Koller of Mt. Abraham Union High School. Photos by the Youth Safety Council of Vermont). « Free Advanced Driving Skills Class for Teens Presented by Ford in Essex Jct.